Ultra HD RAI channel now free to air on Hotbird satellite. 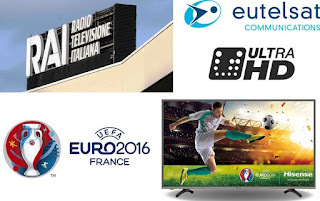 The 4K Ultra HD test channel from the Italian public broadcaster RAI has been on the Hotbird satellite for some time. On June 13, anyone can watch the TV channel with the right satellite TV equipment. RAI 4K is a test channel through collaboration with RAI launched on Tivusat and Eutelsat and also available at some major TV satellite. The channel is part of the encrypted transmission source of Tivusat and can only be viewed with a registered provider smart card. Many Italians living in the Netherlands have a Tivusat smart card that can be given to Italian public and commercial channels. In the Netherlands, the sale of some speciality satellites will also need CI + module, including the smart card. However, the registration is mandatory data or a person registered in Italy. RAI 4K temporarily transmitted without encryption on 13 June. This is due to the transmission of the image record from Stanotte to Venezia. This event takes place this weekend and will be broadcast simultaneously on June 13 from 9:30 pm on RAI UNO, RAI UNO and RAI HD 4K. In the Netherlands, RAI ONE with several suppliers, including Ziggo, KPN and Caiway available in the station range. Ziggo can be viewed through an application on the premium TV decoder Ziggo Mediabox, previously Horizon Media Box is present. RAI 4K is available on the Hotbird satellite at 13 degrees East through the transmission frequency 12576- H - 30000 - 3/4 - DVB-S2 - 8PSK.